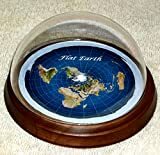 For everyone who has spent way too long, gone way too far, and believed way too much on the Internet, this cool new Flat Earth Snow Globe is just for you. Forget all the fake news from professional news organizations and all the total lies from agenda-driven scientists, because completely random people all over the Internet are obviously the true experts on everything, especially YouTubers. I doubt any of the few remaining sane people left on this globe plan on turning off the Internet for a mental break or skipping their "smart" phones far into a river anytime soon, so they might as well just join the ignorant masses and believe the Earth is flat too. It's all over everyone... there's a glitch in the simulation, or maybe it's just April Fool's Day?